If you understand the Doji, it becomes easy to extract huge profits from the markets, whatever market that maybe. What is a basic premise of stock analysis? To evaluate when it is the exact right time to buy! Whether you are using fundamental analysis or technical analysis, your stock analysis is to try to maximize your profits. If this seems a little bit elementary, it is mentioned for the sake of pointing out that most stock analysis waters down that basic function. Utilizing fundamental research and/or technical analysis seems to include a lot of caveats that tend to reduce returns. Candlestick signals provide one major contributing factor to stock analysis. They do not care what all the experts are saying, they do not care what the market trends are, they do not care what the general perceptions are of a stock or an industry. The candlestick signals tell you exactly, right now, what investor’s sentiment is doing today. Whether doing stock analysis or market analysis, the candlestick signals provide a proven track record for hundreds of years. This past couple of weeks, the doji has been an integral part for analyzing when the market was turning down and when the market was turning back up. Understanding what the doji is representing makes for a very easy platform for successful stock analysis. It illustrates indecision. That indecision is the foreboding of what investor’s decision is going to be. Market Direction - As projected a few weeks ago, the doji was an important factor for identifying when they were going to take the market down. As you will note, on March 5, 2004, the Dow formed a long-legged doji. This occurred after two previous days of doji's. If a doji represents indecision on investor’s part, three days of doji's represents more indecision. Additionally, if a doji represents indecision, a long-legged doji represents greater indecision. As seen on March 6, 2004, the following day clearly demonstrated what investors decisions were after a period of indecision. They were going to start selling. The market closed below the 50 day moving average. This was the time if long, that the longs were closed out and shorts established. The open on the next day showed continued weakness. The downward trend continued until we saw the formation of two bullish harami's. The stochastics were in the oversold area. This indicated an opportunity to close the shorts and buy some longs. However, two days later, another doji appears. This is where Candlestick analysis dramatically improves your returns. Although a doji is an important signal in either the overbought or oversold area, the Japanese say to always take heed when you see a doji. A general rule of thumb is that a trend will move in the direction of the open of the day following a doji. As seen two days after the second harami, the doji is then followed by a bearish day, producing an evening Star signal, although it is not formed when the stochastics are in overbought area. The same logic needs to be applied when this formation is seen anywhere. It basically tells us that the Bulls were in control one day, there is indecision the second day, and onethen the Bears have taken over. This gave us an immediate alert that the uptrend was not in progress. Does this mean that we covered some shorts, went long, and then had to reverse two days later? Sure, but that was what the market was telling us to do. There will be periods in the market where the direction of the trend moves back and forth. The point of investing is to keep your positions on in the direction that is most likely to make you money. Moving in and out is sometimes a necessity. It may create small losses or at best, very small gains. If you can keep your account relatively flat during the sloppy periods, by constantly keeping your positions in the direction of the trend, then the big profits when you are positioned correctly as a big move starts. In some cases, a big move can be 4 to 5 days and hopefully longer. After a couple more down days in the Dow, the downtrend is stopped by two more doji's, with stochastics still in the oversold area. These Doji's, followed by a very bullish day, clearly illustrates what investors decided on doing after the indecision revealed by the Doji days. 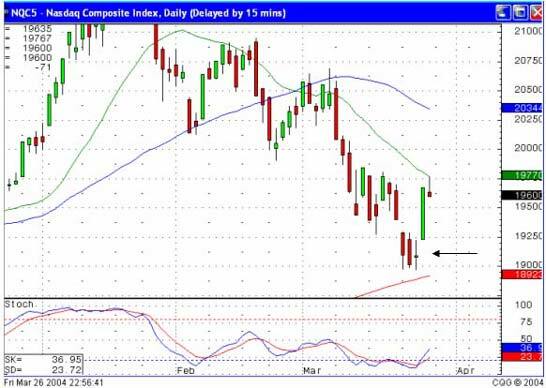 A Doji, in an oversold condition, followed by a gap-up and bullish trading day is a very powerful buy signal. 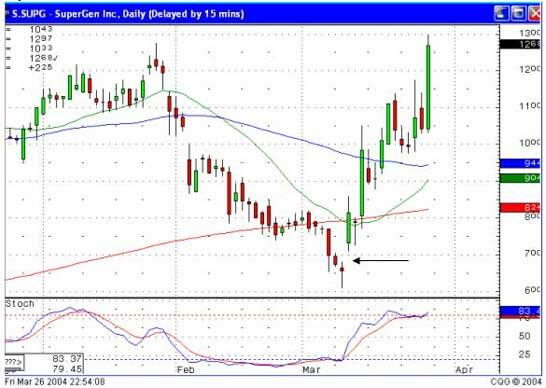 The SUPG chart demonstrates the strength of a doji at the bottom followed by a gap-up bullish day. These are the type of chart signals that we like to find. Our purchase price was approximately $8.20 area on this trade. A gap up from a doji illustrates that the buyers are in this stock with enthusiasm, which is just the type of stock we want to buy. With that in mind, note the doji followed by a gap up in the NASDAQ at the end of this week. The doji/harami, with stochastics in the oversold area was the alert that there was going to be a change of direction. Knowing that makes the strategy decisions very simple the next morning upon waking up and seeing that the futures are positive. That clearly says to close the shorts and buy immediately. This is not rocket science, this is just following signals that have worked over and over for hundreds the years. The Doji should be a neon sign to investors that a change is about ready to happen provided the overbought and oversold parameters are in place. The Doji is also comprised of one candle. The Japanese say when a Doji occurs, one should always take notice. It is one of the most important Candlestick signals. The formation is created when the opening price and closing price are the same. 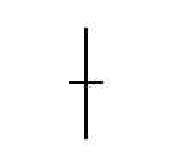 This forms a horizonal line. The implication is that the bulls and the bears are in a state of indecision. It is an important alert at both the top and bottom of trends. At the top of a trend, the Doji signals a reversal without needing confirmation. The rule of thumb is that you should close a long or go short immediately. However, the Doji occurring during the downtrend requires a bullish day to confirm the Doji day. The Japanese explanation is that the weight of the market can still force the trend downwards. The Doji is an excellent example of the Candlestick method having superior attributes compared to the Western bar charting method. The deterioration of a trend is not going to be as apparent when viewing standard bar charts. The open and the close are the same or very near the same. The length of the shadow should not be excessively long, especially when viewed at the end of a bullish trend. A gap away from the previous days close sets up for a stronger reversal move. Large volume on the signal day increases the chances that a blowoff day has occurred although it is not a necessity. After an up-trend or a downtrend has been in effect, the Doji occurring immediately reveals that there is now indecision in the bull's and the bear's camp. After the trend move and the price opens at a level, the bulls and the bears move the price up and down during the day. By the end of the day, the price closes at or very close to the level that it opened. This state of equilibrium now has the controlling group in some doubt. The opposite group builds up confidence that the trend has lost steam. Everybody tells you to cut your losses short and let your profits run. But nobody ever chose do how to do that. The Candlestick signals make that a very simple process. They get you out of bad trades very quickly so that you can move your money to a chart pattern that has a very high probability of making you money.